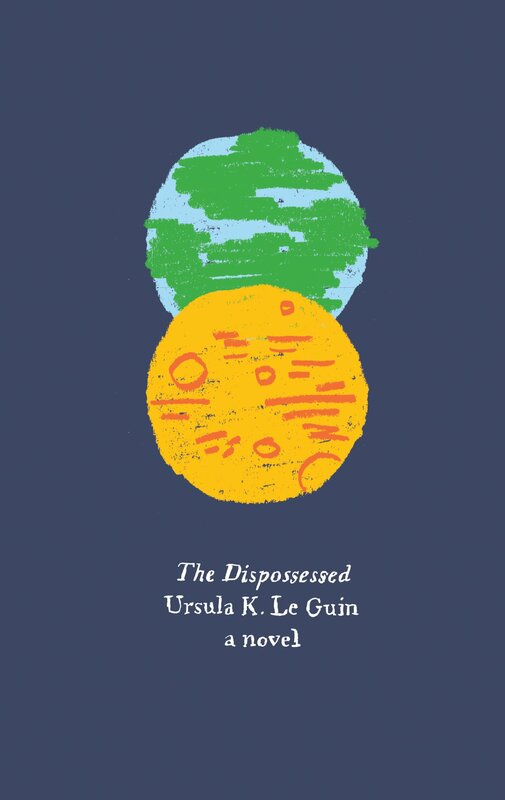 I recently finished The Dispossessed by Ursula K. Le Guin. It’s the fifth in her Hainish Cycle, a series in which a variety of humans and human-variate species are slowly working to create a kind of federated utopia of planets. This particular installment was published in 1974 and received the Nebula, Hugo, and Locus awards for that year. My edition is the Olive Edition reprint and it sits at just under 400 pages. The Dispossessed is a key work in the Hainish Cycle. It describes the creation of the Ansible, a communication device that allows planets to communicate with one another in real-time, despite how far apart they are. As a result, the story is key to a number of later stories in the same universe and shines light on some of the stories preceding it, like The Left Hand of Darkness, where the ansible is used. The Dispossessed takes place in the Cetian system on two planets that are paired together, revolving around one another in a moon-planet like relationship. The main character, Shevek is an Odonian from Annares, a member of a religious-political faction that fled from Urres, the more lush of the two planets, over 150 years prior. Shevek and his fellow Odonians live in a kind of anarcho-Marxist utopia, where there is no central government, and people work communally to do what work needs to be done. Shevek has spent his life dedicating himself to physics and the dilemma of sequentialism and simultaneity. In a sense, he’s dealing with the temporal aftermath of Einstein’s theory of relativity, and has come to find that his work is stunted on Annares; he’s frustrated by the inability to communicate freely with Urresians and, when the story begins, he is about to travel to Urres, the first Anaresti Odonian to do so since the Odonians left 150 years ago. In contrast to Annares, Urres is a more typical capitalist and patriarchical society. While Shevek has gone there in search of a kind of eureka moment in his work and to disseminate it according to his ideal of freedom of information, he’s soon to realize that there’s more to the capitalist political system than he had thought and he becomes embroiled in political conflict. In this story, Le Guin is examining a number of interesting political situations. While clearly critiquing patriarchal structures and the capitalist system, she is also examining anarchim, particularly anarcho-Marxism (the intersection of anarchism and Marxist communism) in the face of extreme resource scarcity. Both fans and critics have pointed to the story as an analogue for United States/ USSR relations in the Cold War. It brings under fire both systems and the use of proxy wars. While anarchism comes out in a more favorable light, Le Guin also points to the difficulty in having a society without government, including the continuation of power struggles that are maintained by natural social structures outside of government structures, the exercise of social pressure as a replacement for a criminal justice system, and the difficulty in providing for society’s needs without bureaucracy supplanting the anarchist system. The story is interesting, and the plot is complex. Structurally, it’s split between two timelines: Shevek on Urres and Shevek growing up on Annares. This is part of what allows Le Guin to provide multiple criticisms throughout the story without them piling up on one another. It also provides a slow insight into Shevek’s “present” timeline with the problems that faced him before leaving for Urres. Le Guin takes a great deal of time describing the Odonian’s lives and structures. The reader is meant to explore Odonian society with and through Shevek’s growth, and through Shevek’s later observations contrasting Urresti (captialist) society with his own. This also allows the reader to slowly become accustomed to the strange speech patterns and behaviors of the Odonians, and to ease into criticisms of an anarcho-Marxist society that, especially during the Cold War, readers may have jumped to quickly and without examining their own assumptions. Shevek is out-of-place with his fellow Odonians. Their society has come to a point of complacency with bureaucracy that constantly seems to frustrate him; he has no real outlet to overcome the social and political structures that seem to stifle his work; and he’s significantly more self-isolating than is considered acceptable by social norms. This makes him a very approachable character, not just to the reader, but also to the “true” anarchists and outliers of Anarresti society. Shevek finds himself constantly drawing people who want to challenge the system, as informal as it may be. I liked this about him. I think it was a very successful strategy for Le Guin and really helped the reader to digest what was happening. His fellows call him an “egoizer,” a “profiteer,” and a “traitor.” In many ways, Shevek is more likeable for the taunts and anger he draws. The science is pretty handwave-y and the idea that a planet can be another planet’s moon was a little silly. But the science isn’t so much the point. Le Guin uses it as a way to talk about freedom of information and intellectual integrity. Shevek is constantly finding himself at odds with his own moral system, and that espoused by both Annares and the Urres. He’s constantly rejected by one and is being misused by the other. His search for a way out of the dilemma is interesting and leads him to take action that may otherwise be counter intuitive. The side characters are interesting, particularly Shevek’s partner, Takver. Takver is a fish geneticist and the two are often far apart, fulfilling society’s needs where needed, but constantly drawn back to one another. Takver is left to deal with the consequences of Shevek’s studies, her own drive to create and understand, and the bindings of family life often by herself. While she doesn’t have her own point-of-view, she comes off as very strong and perhaps more resilient and accepting than others deserve. Le Guin at times seems like she wants to dive more into Takver’s story, but can’t, which made me as a reader feel frustrated at times. Overall, I enjoyed the story and its contrasts and comparisons. I liked the characters and the way the story took twists and turns. It’s criticisms were appealing to me, and I liked having more background into the grown of the Hainish universe and its technology and people. I would suggest reading this as one of your first Le Guin books, though I am partial to Left Hand of Darkness, because I think the context it provides helps to make later books a bit more comprehensible. Have you read The Dispossessed? What did you think? Leave your thoughts in the comments! This entry was posted in Reviews, Videos and tagged book reviews, Books, Feminism, Le Guin, Odonian, Physics, Science Fiction, Shevek, The Dispossessed.